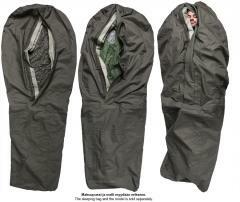 A serious bivy cover for your sleeping bag. Made to comply with NATO standards, this Gore-Tex bag should meet any needs. Made of tri-laminate Gore-Tex fabric: top layer 100% waterproofed polyamide, mid-layer PTFE (the membrane itself), bottom layer 100% polyamide. Zipper closure with fully waterproof zipper and storm flaps on both sides. 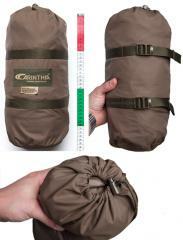 Generously sized: takes in just about any sleeping bag, even the foot end has quite a lot of space. Mesurements flat about 230 x 90 cm. Weight 1 kg, dimensions packed about 35 x 15 cm. This does not even try to be one of those ultralight solutions, but rather a sturdy, reliable cover for demanding use. Protects your sleeping bag not only from moisture, but other abuse as well. In addition, a bivy cover makes your sleeping bag a tad warmer. Complies with NATO standards, NSN 8340-41-000-2532. If you really have to machine wash this, do it in 60 degrees Celsius. However, if at all possible, avoid machine washing - do it by hand if necessary. Fortunately these things don't even get seriously soiled easily. Avoid storing this wet. If possible, dry it before stuffing it to the provided packsack. If the cover needs to be repaired, we suggest using a proper patching kit. If one is not available, some duct tape should do in a pinch. We have both. Armeijassa tuli testattua läpikotaisin. Suurin osa öistä nukuttiin taivasalla ja tämä pitää veden ulkona. Tilaa on reilusti eli voit ottaa esim kengät sisäpuolelle, niin ei pääse kastumaan. Koko on myös sen verran reilu että vesistön ylityksissä heitettiin rinkka sisään ja muutakuin uimaan.